About 15 years ago, I ran into an article that was published in Wavelength magazine in 1990 called “Slap That Bass! – New Orleans String Bass Pioneers”. Naturally, with a title like that, it immediately grabbed my attention. I was pleasantly surprised to find that I had discovered possibly the most comprehensive source for information about early slap bass players. Several months ago, I had the good fortune of spending some time in New Orleans. My time was divided between playing traditional jazz on the legendary streets of the French quarter, and doing research on various subjects in slap bass history. I was also able to track down the author of this amazing article, Dan Meyer, and we shared some great discussion. The article hasn’t been available on the web since the tragic hurricane Katrina hit town. Meyer was kind enough to let us republish an updated version of his article for the Art of Slap Bass website. Hope you’ll enjoy reading it as much as I did 15 years ago! Disclaimer: Photographs published on this page were not originally included with the article and AOSB claims no copyrights on any of them. If you’re the legal owner of any of these photos, and wish them to be removed, please let us know. The cover of the Wavelength magazine is an original piece of art; if anyone knows the artist, please let us know as well. New Orleans has had a strong tradition of producing great bass players from the last century up to the present day. New Orleans string bass players received much attention when a new sound was becoming prevalent in the rhythm sections of both large and small bands during the late 1920’s and early 1930’s. The string bass, plucked and slapped, was filling the role more usually filled by the tuba. Many of the leading national dance bands added slap bass players to their rhythm sections–whenever possible, New Orleans musicians. 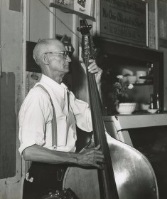 Although musicians from elsewhere soon started imitating this style, it was clear that the leading exponents of slap string bass were all New Orleanians. 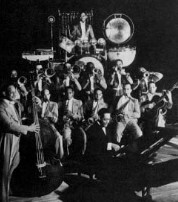 Wellman Braud (born 1891, died 1967) may have been the most important single popularizer of the slap style during his long stay with the Duke Ellington Orchestra, making numerous recordings and frequent radio broadcasts. Braud was not alone in bringing this style to national attention. The string bass work of Steve Brown (c. 1890-1965) rivaled the cornet work of Bix Biederbecke in amazing listeners to the Jean Goldkette Orchestra. Wellman Braud said that Brown was the greatest of all bass players. The great George “Pops” Foster (1892-1969) gave rhythmic drive to the bands of Luis Russell and Louis Armstrong while teaching the slap style to some of the best northern musicians. Foster was a wonderful creative musician. Foster wrote a fine autobiography with Tom Stoddard. The dates and incidents in the book should be compared with other sources. John Lindsay (1894-1950) was a trombonist (he recorded on that instrument with the A.J. Piron Orchestra) who said he switched to string bass in order to get more jobs. His bass is heard on the classic Chicago 1926 Jelly Roll Morton Red Hot Pepper records, and in the ’30’s Lindsay was one of the group of New Orleans and Mississippi musicians in the Harlem Hamfats, a band which kept one foot in the New Orleans tradition while pointing the way towards the Rhythm & Blues style of a decade and a half later. Al Morgan (1908-1974) was youngest of the pioneers who popularized slap style for the national audience, Morgan went up to New York and became the first string bass player to record with Fats Waller in 1929. He returned to New Orleans, taking part in the great Jones & Collins Astoria Hot 8 recordings. 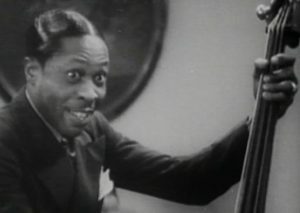 Morgan provided the slap bass backing for Cab Calloway’s Orchestra in the early ’30’s. He developed a number of acts with Calloway (some of which were later continued by his successor Milt Hinton), including a routine on “Reefer Man”, an abbreviated version of which is preserved on film in the W.C.Fields movie “International House”. What was the origin of this new instrumental style? In tracing the history of slapping the bass, it is important to note that early recording simply couldn’t pick up the string bass. Before the mid 1920’s, records were made by the pre-microphone “acoustical” process, where musicians played into the large end of a megaphone-like recording horn, the small end of which was attached to a diaphragm which caused a needle to vibrate, tracing the sound waves into the grooves of the master record. While this proved satisfactory for recording most mid range frequencies (such as the human voice, trumpets and trombones), picking up other sounds, particularly string instruments and high and low frequencies, presented difficulties for the phonograph’s “tin ear”. Bass response was particularly problematic. The worst part of the problem was that bass sounds loud enough to be clearly recorded tended to knock the recording stylus right out of the groove (Electric microphones did not totally solve this– as late as 1943 Chester Zardis’ slap bass knocked out the stylus in a George Lewis recording session). Some experiments were tried, The Edison Phonograph Laboratories constructed a giant recording horn. It’s mouth filled a room from floor to ceiling. The length of the great funnel stretched for half a block between two buildings. Edison engineers said that the contraption could pick up and reproduce the lowest note of a bass viol. It was hardly suitable for mass production, however. Despite such experiments, bass response was simply not a high priority with the record companies of that era, Most home phonographs of the time were inadequate to reproduce what little bass response could be picked up. While the better studios of the time could pick up a recognizable semblance of tuba, drummers were usually limited to snares, sock cymbals, and woodblocks, and string bass players were usually told to sit and wait during the recording session. 1925 saw the biggest single leap forward in recording technology of the pre-digital era. The American recording industry’s big two, Victor and Columbia, adopted the new Western Electric recording process. Despite compression of dynamics, this new process provided much wider frequency response and improved overall fidelity compared with the old acoustical process. Most other record companies followed the lead and brought electric microphones into their studios in the next few years. Improved home phonographs, both acoustical and electric, came on the market in order to allow record buyers to hear the fuller range of the new records. In the recording studios, bands were able to use their regular instrumentation and play in a manner much closer to how they played live. At first recording engineers were loathe to feature instruments inaudible only a few years before, but in 1926 and 1927 Victor let Steve Brown record numbers featuring the slap-bass prominently with the orchestras of Jean Goldkette and Paul Whiteman. The records of these popular bands sold well. The string bass revolution now had the mass media of the time behind it, and spread rapidly. When Did Slap Style Originate? The musician who replaced Steve Brown in the Rhythm Kings was “Chink” Martin Abraham (1886-1981). He is perhaps best remembered as a tuba player, though he also played very fine slap string bass. Many New Orleans bass players of the early jazz generations doubled on string bass and tuba. As a generalization, string bass was played more often in dance bands, the tuba in the street with marching bands. However before the late 1920s recording companies preferred the tuba for use on recordings. Simon Marrero (1897-1935) was one of the best regarded string bass players of his generation. He recorded with Papa Celestin and Dave Nelson; on some sides that discographies and liner notes claim are with string bass he can be heard playing tuba. Simon Marrero gave lessons to Al Morgan and to his own younger brother Eddie Marrero. Simon Marrero earned many job offers on his trips up North; he played for a time with the Blue Rhythm band in New York. Ed Garland‘s birth date is given as 1895, He might have been somewhat older; he died 1980, He’s best remembered as bass player with Kid Ory’s Band for decades. Garland said he introduced slap style to California in 1917. Perhaps he introduced it to the parts of California where Bill Johnson hadn’t been playing a couple years earlier. 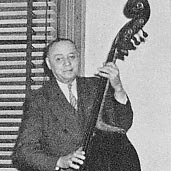 While some New Orleans bass players were spreading the style to other locations, fine bassists such as Chester Zardis (1900-1990), and Sidney Brown (1894-1968), played professionally during this time while seldom venturing far from New Orleans. Just when DID this manner of playing originate? 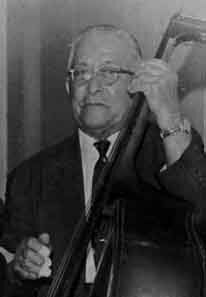 New Orleans bassist Albert Glenny, born in 1870, lived to 1958, said that he almost exclusively bowed during his early career in New Orleans. He was somewhat disdainful of the pluckers and slappers, “that ain’t no bass playing…pick pockpick”, but said he had to learn that newer style in order to keep playing professionally. By the time that Chester Zardis started playing professionally a different attitude had developed. Zardis said that bowing was little used except on waltzes and slow tunes; slapping and plucking were necessary to give the music a real jazz feeling. Apparently the new bass styles took hold sometime between the time when Albert Glenny learned to play string bass and when Chester Zardis learned to play string bass. This was only one of many changes taking place in New Orleans music in the early years of this century, the years which saw the development of the music we now know as “jazz”. There are more clues to narrowing down the time when this new style developed. Many bass players from New Orleans and the surrounding countryside testified that bowing was the standard way of playing in the early 1910s. Eddie Dawson (1884-1972) recalled picking up the picking style some time before the District closed. Storyville was legally closed down in July of 1917, at which time Dawson’s employer in the district helped him get a job at a bank. Joseph “Babe” Phillips was born about 1879, lived to 1960, Phillips played bass for years around St James, St. Johns, and St. Charles parishes, bowing like all the other country bass players he knew. When he came to New Orleans in 1918, he switched to that picking style because everybody else in the city was doing it. Phillips seems to have kept some of the old country bowing style in his playing into the later years of his long career. We have some good clues as when the New Orleans string bass style changed, apparently not known in early 1915, spreading rapidly by mid 1917, and the accepted style by 1918. After returning briefly to New Orleans, Bill Johnson moved to Chicago, where many considered him the city’s best bass man throughout the ’20’s. He helped King Oliver put together his great Creole Jazz Band, made up mostly of musicians a generation younger than Johnson. Because of the recording limitations of the time Johnson recorded with Oliver only on banjo, not his primary instrument. Bill Johnson made a number of fine recordings on string bass in Chicago in the late 1920’s where he demonstrates not only masterful plucking and slapping, but also uses bow work effectively on hot numbers. He taught various Chicago musicians the slap style; Milt Hinton said they considered him the father of that style. Another noted string bass player of Johnson’s generation, Henry Kimball (1878-1931) was praised by Ed Garland, Wellman Braud, and Pops Foster. Kimball is said by some to have been mainly noted for his bow work early on; a 1920 photograph of him with the Fate Marable band shows Kimball plucking the bass strings while holding the bow in his hand. Jimmy Johnson (c.1876-c.1937?) played string bass with the legendary Buddy Bolden at the turn of the century. Wellman Braud recalled that Jimmy Johnson was a good bow man, but used the bow less than Kimball. In 1936 Johnson provided the up-to-date sounding bass work on the recordings made by Don Albert’s swing band in San Antonio. Billy Marrero (1874-c.1920) was Simon Marrero’s father and taught younger players such as Chester Zardis. Zardis gave conflicting answers at different times when asked whether Billy Marrero played slap style. Another of Billy’s sons, Eddie Marrero, took up bass after his father’s death; Eddie remembered his father mainly as a bower. Others have said that Billy Marrero plucked but did not slap the bass. Johnny Prudence (or Predonce) was a contemporary of Billy Marrero. Information on Prudence is scarce; Albert Glenny said that Prudence was the first to pick the bass. Eddie Dawson started out playing guitar and banjo, switching to string bass in 1912. Dawson said after he picked up the slap style he taught it to George Foster, and that Pops Foster copied from Dawson when he was in the Magnolia Band. In his later years Dawson said he believed he “started (plucking) that 4/4 rhythm” behind bands. Another bassist who had played guitar, “Chink” Martin, also claimed to be the first in New Orleans to replace the two beats of ragtime with a four beat bass line, filling out the chord. Music historians will note that pizzicato, or picking strings with the fingers, has a long history in the classical tradition. Pizzicato is usually reserved for occasional passages for special effect instead of the more usual bowing, and is technically different from the more vigorous plucking of the New Orleans musicians. The technically difficult musical slapping of the bass seems to have been completely foreign to the musical world outside of the deep south when the first New Orleans players were demonstrating a mastery of it. Plucking and slapping the string bass seems to have been one of the developments in the New Orleans style of music in the mid 1910s. Like jazz itself, we might not be able to attribute it’s origins to any one musician. Again like jazz, it can however be said that slap style bass was a New Orleans innovation to which many fine musicians made important contributions. This new rhythmic voice found its way not only into jazz and swing, but had also diffused by the middle of the century into such diverse music as country, bluegrass, Caribbean, and Guatemalan marimba bands. 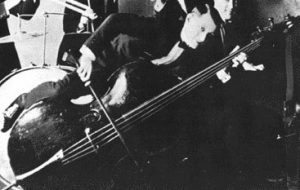 Even when the upright double bass itself is not present, the vigorous New Orleans bass line has influenced subsequent rhythm & blues and other popular musical styles. The New Orleans musical pioneers who developed their styles of playing the string bass without the bow imparted both specific and broad musical influences on future generations. I wish to acknowledge the facilities of the Hogan Jazz Archive, Tulane University, especially the oral history collection. Thanks to Richard B. Allen, Bruce Raeburn, Al Rose, William Russell, Tom Saunders for their help. Next articleNew article about the origins of slap bass!